Whispers in the Loggia: On Fatima's 100th, The Shepherd's Message: "Honor Your Mother"
On Fatima's 100th, The Shepherd's Message: "Honor Your Mother"
Even as the 19th overseas visit of this pontificate makes for yet another formidable (news-)hill to climb, it bears recalling that the Pope has a harder time still going down steps. 13 October 2013 – As previously noted, whenever the Theotokos comes around, the 266th Bishop of Rome simply loses himself and is spiritually transported to another place. To be sure, a very simple explanation underpins all this. For those who grasp it, no words are necessary... for those who can't, nothing will ever suffice. 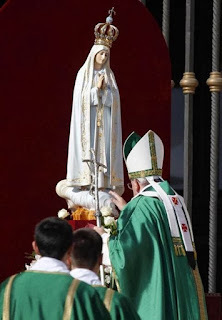 In sum, Jorge Mario Bergoglio is possessed of a Marian devotion as traditional and intense as that of the famously "Totus Tuus" John Paul II – a zeal much of Francis' horizontally-focused fan-base only begins to acknowledge in their condescension to it. At the same time, the Pope's passion for the Madonna isn't something he sees as meaningful merely for his own spirituality, nor as part of a push to "turn the clock back" – his term, of course – but instead as an emphatic endorsement of the life-giving, ever-potent popular piety which remains a cornerstone of his desired "poor church for the poor": the essence of being Catholic for those who rely on and endure in the faith amid life's gravest tests... a practice which the church's shepherds are called to embrace and integrate into the very heart of their ministries if they genuinely seek to attain the now-omniquoted "smell of the sheep." "[The people] are always asking for something closer to Jesus, they are sometimes a bit insistent in this. But it is the insistence of those who believe." Returning to May 2017, at least when one's got the signals right, this weekend has been anticipated for just shy of four years.... Because, to repeat, if you don't see the moment with the eyes of faith, you miss everything. 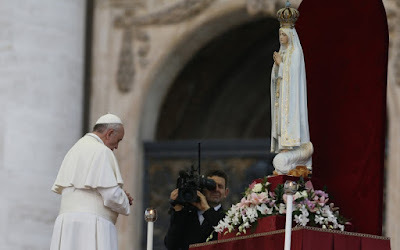 At that time of his first meeting with the original Fatima image, the Pope composed and delivered an Act of Entrustment to her – the second he had done to a Madonna (after beginning the practice in tears at Aparecida), but in this case a prayer set to be be expanded upon this weekend. to heal and to save it. to reach us and the perpetual warmth of your smile. guide us all on the path to holiness. and give us all to your beloved Son, our Lord Jesus. Amid Mother of All Countdowns, Pope Drops "Bombs"